Actually not so plain, but carefully designed to create a simple contemporary effect. Precast slabs in easy to handle sizes and cast in our upside-down method, using high strength cementious grout. 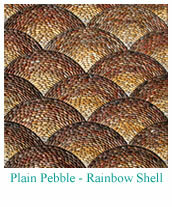 Here are some examples of simple pebblework; an alternative to our more usual elaborate style. Absolutely flat and non-trip; durable and frost-proof. The same meticulous technique of pebble selection and placing as in our one-off commissions. Can be laid on a mortar screed by your contractor. These will be useful for detailing the perimeter of a paved area, or as a decorative edging for a path. 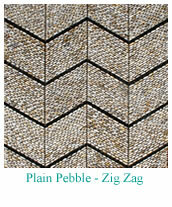 For where pebble pattern is required, rather than an elaborate design. FROM £600-£800 PER SQUARE METRE for all-over patterns. Borders from £85 per running metre. Please contact us for dimension information, & to check price & availability.